I didn't think I had that much blooming but then I started walking through the yard . . . we have a TON blooming right now. My dogwood is a beautiful shocking pink right now. Happy bloom day! 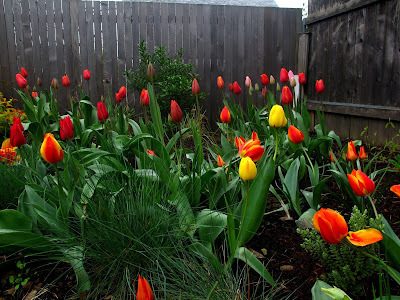 Be sure to head over to our host Carol's site to see what else is blooming. Wow! That is an explosion of blossoms. Beautiful. The blooms on your 'Oregon Sunshine' blueberry are gorgeous. They are worthy candidates for the ornamental garden completely aside from their food value. My fringe flower is right on the same schedule as yours, but my camas are laggards. After seeing yours, I really hope mine bloom this year! I hope the blueberries thrive because everything about them is pretty. I also planted some white camas, which haven't yet shown up. Hopefully yours are just taking their sweet time showing off. Oh, dogwood! Tulips! Flowering currant! Lovely, all of them! Think you could send a few of those blooms my way? The dogwood is so pretty! Our neighbor has two, but they seem diseased or at the least very unhealthy. My daughter just planted her oxalis yesterday, and I've been coveting trilliums...there may be one in my future. I think we called them "stinking Benjamins" where I grew up - do they smell? Can you believe that dogwood is 75 years old? It fades to bubblegum pink by the time Mother's Day rolls around, but right now it's much prettier. I think they might be a bit mushy by the time they arrived to you, but okay!